It was a bright sunny weekend of so-called winter season in United Arab Emirates, when I asked my friends : Let’s experience something different today. It was mid of Jan. 2010 and we were having lunch together in a restaurant In Ajman state of UAE. 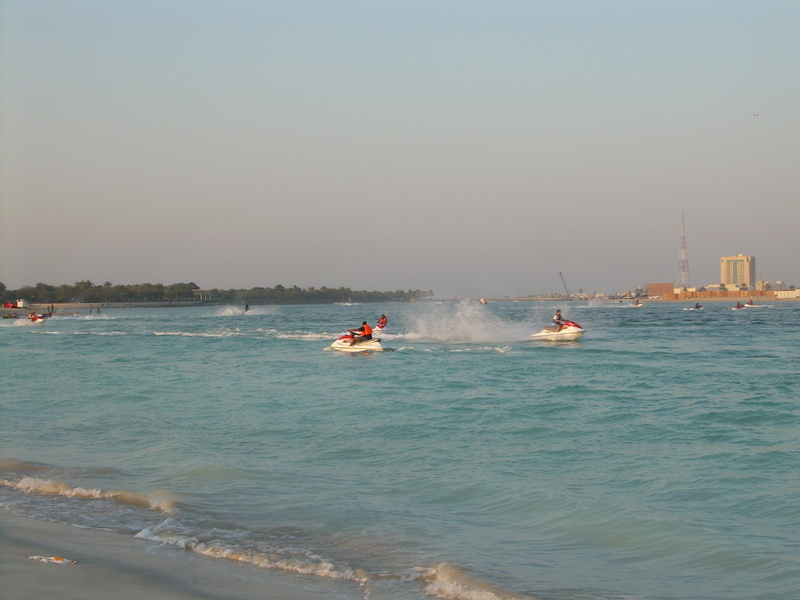 After joking with each other and discussing some stupid ideas, we agreed to even stupider idea; to go for jet skiing. You might be surprised that why it was a foolish idea but you would agree with me by knowing that, at that time, none of us knew swimming. The next question was: where to go for jet skiing? We did a simple thing. We got out of restaurant, stopped a taxi and asked the driver to drop us on any near-by marina. 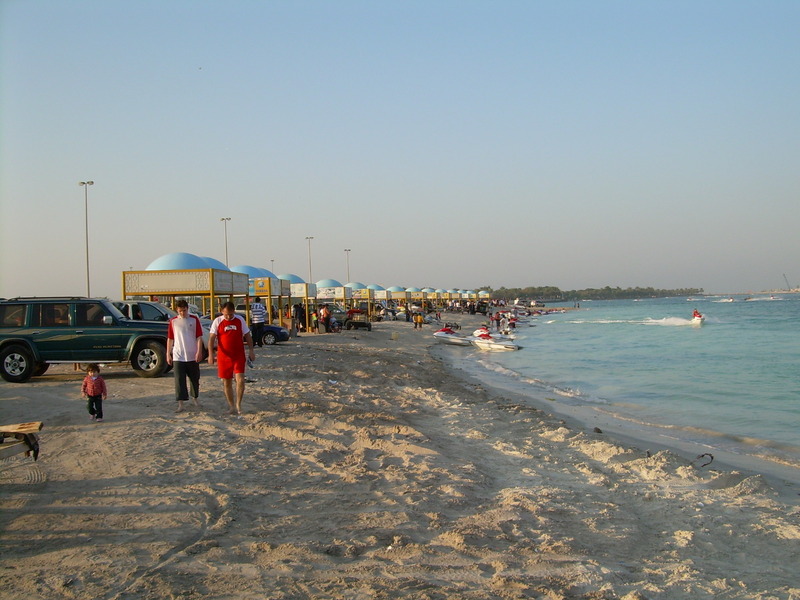 After a drive of half hour, we were finally at Sharjah corniche (beach). It was a creek and sea water was pretty calm. 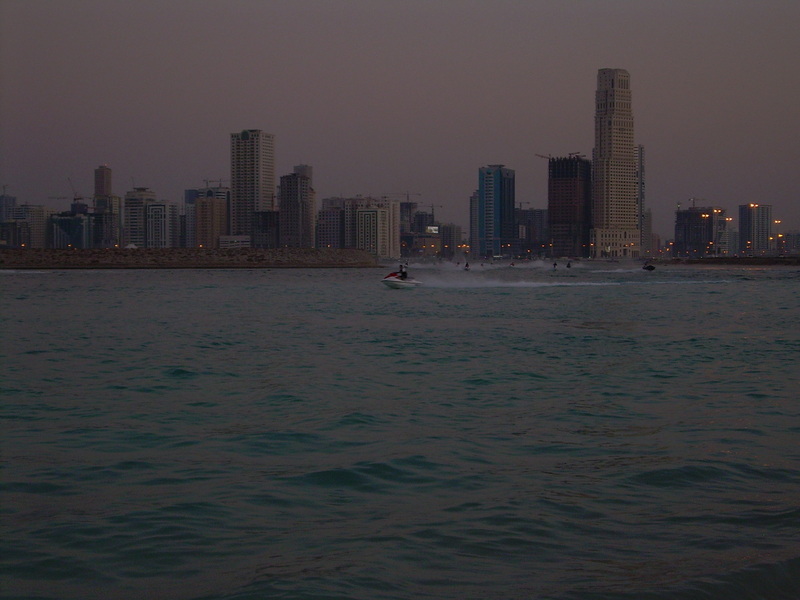 A view of marina at Sharjah corniche. Water Scooter riders performing some stunts and splashing water. 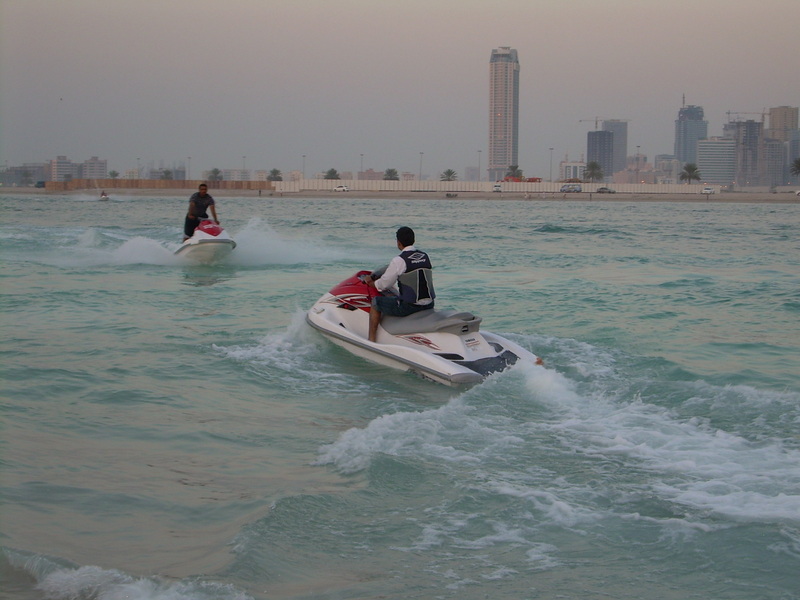 Seeing some water scooter expert riders maneuvering in sea water, coming close to the shore and speedily going back while splashing water on onlookers, energized me. I was keen to experience the adrenaline at full throttle. However the feelings of my friends were totally opposite. They quitted one by one, all three of them. Today I think that they were right as It was definitely risky to drive a watercraft in sea when one is not good at swimming. However I remained firmed and decided to go for it. There were many parked water scooters available for rental with owners awaiting customers. I checked with one of them. The rent was 100 AED (26 USD) for half hour. I paid him the amount and he started filling the tank of scooter with fuel. After wearing life jacket, I was ready to rock n roll. Since it was first time for me, I inquired him about the controls of the craft. 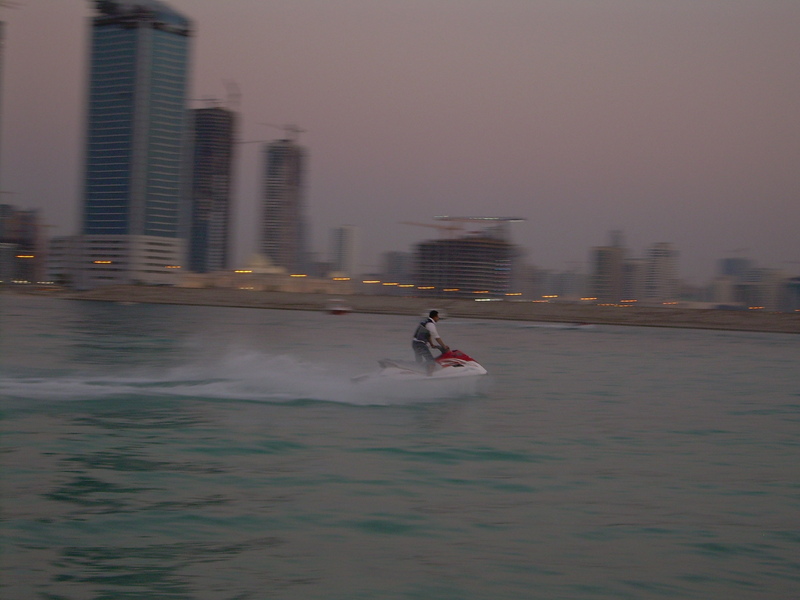 He stood beside me on water scooter and made a small round in sea while explaining me the controls. Me, leaving the coast on water scooter. I was a bit cautious for initial few minutes. I took couple of slow turns and realized that water craft was very stable. Within a while, my hesitance gone away and I started cruising the vehicle at high speed. It was getting dark and I was enjoying the speed. After around 15 minutes, I became so confident and excited that I stood up on the craft while cruising at full throttle. The craft was just like flying in the air and hitting the water. Me, cruising at full throttle. Finally the time was over and I had to turn back to the shore where my friends were waiting for me. My clothes were half wet with some salty sea taste on my lips. It was a wonderful experience. But I would definitely recommend others to not follow my crazy act and refrain from sea waters unless you are a good swimmer.